They call them ‘Canada’s first family of the sport,’ and both Nick and Glenn Hoag continued to add to their Canadian legacy Friday night with a 25-18, 25-19, 25-18 sweep of Mexico in the men’s indoor volleyball opener. They call them 'Canada's first family of the sport,' and both Nick and Glenn Hoag continued to add to their Canadian legacy Friday night with a 25-18, 25-19, 25-18 sweep of Mexico in the men's indoor volleyball opener. The journey to gold starts with the patriarch and coach Glenn Hoag, who is no stranger to the Canadian volleyball circuit. Glen Hoag was a part of the team which finished fourth in the 1984 Olympics in Los Angeles, the best showing of a Canadian men's squad to date. He currently coaches the Arkas Sports Club in Turkey and has acted as the national team coach since 2006. His son, Nick Hoag, the youngest member of the Pan Am team at age 22, has started to make a name for himself, recently coming off the bench to hit the game-winning spike that sealed the national championship for his club team back in Paris. Mother Donna played for the women's national team and older brother Christopher also plays professionally. For Nick, coming back to Canada and wearing the Maple Leaf under his dad's leadership is a dream come true. "It's great, everybody trusts Glenn, he's a great coach," he said after the team's win at the Exhibition Centre. "It's difficult sometimes, it's a different relationship but I enjoy it, I enjoy every moment of it." The team, which is ranked 14th going into the Pan Am Games, has its sight set on qualifying for the 2016 Rio Olympics, a feat no Canadian men's team has accomplished in over two decades since finishing 10th in 1992 in Spain. "For now, it's the Pan Am Games but we have a big tournament coming up called [the] World Cup in Japan. That's the first qualifier for the Olympics and our next objective is to qualify," said Hoag. There will be some tough competition at the Pan Ams this year as seven out of the top 15 teams in world rankings will be playing, including Brazil, which has won gold at the previous two Games. The Canadians will now face Puerto Rico on Sunday and close out the group stage with a game against the powerhouse United States on Tuesday. Their schedule has been packed in recent months, traveling from the Maritimes to Bulgaria, Cuba and Argentina for World League play, where they finished third in their pool with a record of 6-6. The high amount of games in a short time together has allowed for the team to come together as a cohesive unit – something that could have been difficult for the players who have spent the year playing for different league teams around the world. 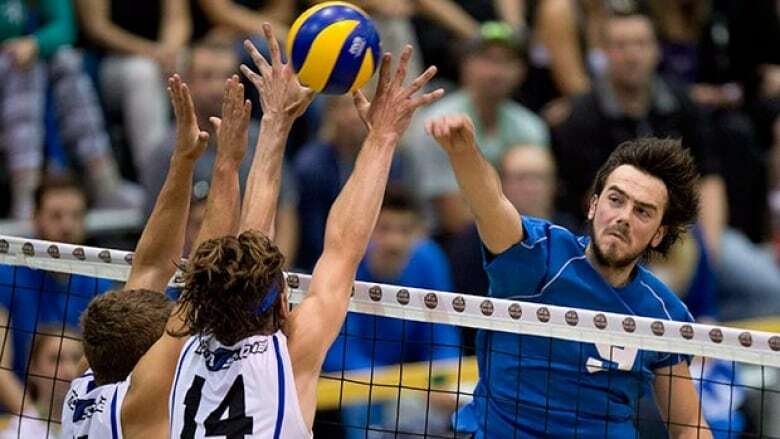 Nick, who missed the World League due to injury, is excited for what competing at the Pan Am Games on home soil can provide a sport like volleyball. "Exposure, for sure. It's in Canada and it's not just a volleyball tournament, it's a multi-sport tournament," he said. "People from other sports come and see [the games], fans from other sports come and see. It's really amazing. "It's different for people to watch from TV to live and I think it'll attract a lot of people to it."